The Seven Sisters waterfalls is a natural phenomenon which has to be seen to be believed. It is a system of seven related waterdalls on the northern side of Geirangerfjorden, in Møre og Romsdal county of Western Norway. The tallest of the falls has an enormous free fall of 250 meters (820 ft). Contributor Aerial Norway created this epic aerial video of the falls, taken in early summer when the snow melting from the mountain peaks swell the flow over the falls. 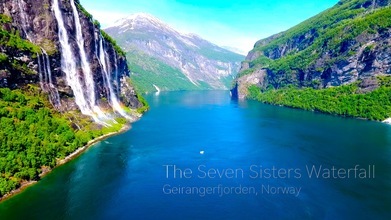 Description: "The Seven Sisters" is located on the northern side of Geirangerfjorden, and directly across the fjord lies a single waterfall called "The Suitor". The legend of the seven sisters is that they dance playfully down the mountain. Meanwhile, across the fjord, the suitor (or courter) flirts playfully with them from afar. This footage is taken in early summer when the snow melting from the high mountain peaks are making the waterfalls bigger and more majestic.